A. Your only path to profitable, sustainable organic growth is in creating value for your customers. B. The only way to create customer value is by improving important, unmet customer outcomes. C. Most B2B companies do a poor job today of identifying which customer outcomes to improve. 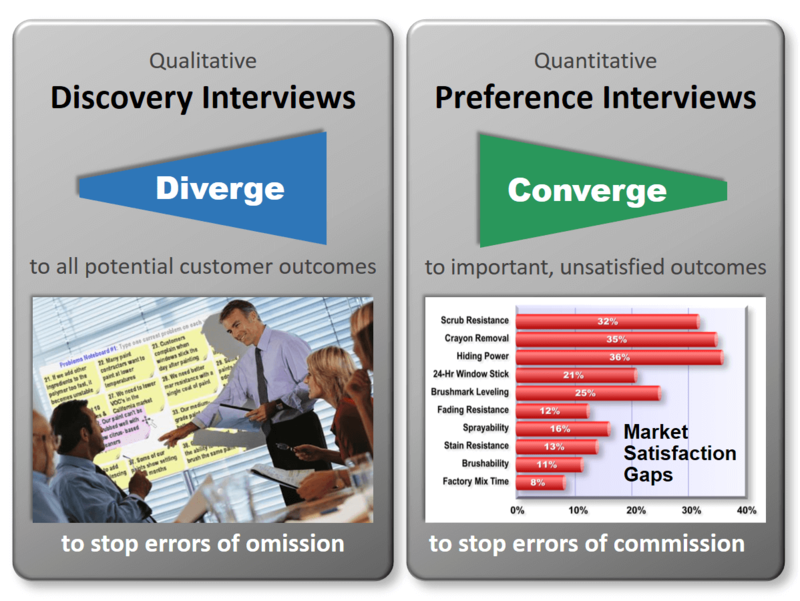 D. Proven methods are now available to confidently target a markets’ important, unmet outcomes. Our brand-new research focuses on points C and D, so I’ll be brief in addressing points A and B. Nothing can increase the market capitalization of your company like above-average, profitable, organic growth. Once investors realize you’ve figured out this whole growth thing, they’ll reward you with a higher P/E ratio. So your higher earnings get multiplied by a higher ratio. A thing of beauty. What other ways might you achieve such growth? Lowering prices? Nope… not profitable orsustainable. Delivering higher-quality products? Oooops… three decades late for that. Nurturing intimate customer relations? Ahh, if only those purchasing agents hadn’t become so cold-hearted. Cutting costs? Nice for short-term profits, but not so good for growth. Focusing on strategically-defensible markets? Good to do, but today innovation can quickly upend any industry’s Porter’s Five Forces. Nope, it’s all about what you do for customers. Peter Drucker said it well: “The purpose of business is to create and keep a customer.” May I be blunt? The more you distract yourself with anything other than creating value for customers, the more you restrain and delay the growth you say you want. I use the term “customer” loosely. It could also mean your customers’ customers, or others down the value chain. In B2B there are only two types of customer outcomes (desired end results) that matter: 1) any process down the value chain, and 2) the final product at the end of the value chain. Intermediate products don’t matter… but that’s a discussion for another day. The time it takes for customers to call for lower pricing is determined by whether the suppliers are on speed-dial. The point is, you may think you create value in your laboratories or factories. But customer value is never created until a customer outcome is improved. This may seem like semantics, but you will be rewarded by obsessing about customer outcomes above all else. It’s certainly more fruitful than fretting over financial results, which tends to be a spectator—not participant—sport. Especially in B2B, where knowledgeable, interested, objective customers will explain these outcomes… if you know how to ask. Is it clear you must focus on important, unmet customer outcomes? If you focus on unimportant outcomes, customers will greet your product launch with a collective yawn. What about satisfying outcomes that are already being met by your competitor? That’s a great idea. For your customers. Not for you. Once you match your competitor’s product, the time it takes for customers to call for lower pricing is determined by whether the suppliers are on speed-dial. In some ways, this isn’t a “news flash.” As long ago as 1971, research identified the #1 cause of new product failure as “inadequate market analysis. Let’s look at some new AIM Institute research that underscores just how “inadequate” typical B2B customer insight actually is. The impact of interviews is huge! When asked, “How much have these interviews impacted the design of your new offering?”… 86% of teams said the impact was “great” or “significant.” Now, I don’t have the kind of mind that can bend spoons, but here’s my conclusion: Without these interviews, teams would have developed a different product. And not just a little different… significantly or greatly different. 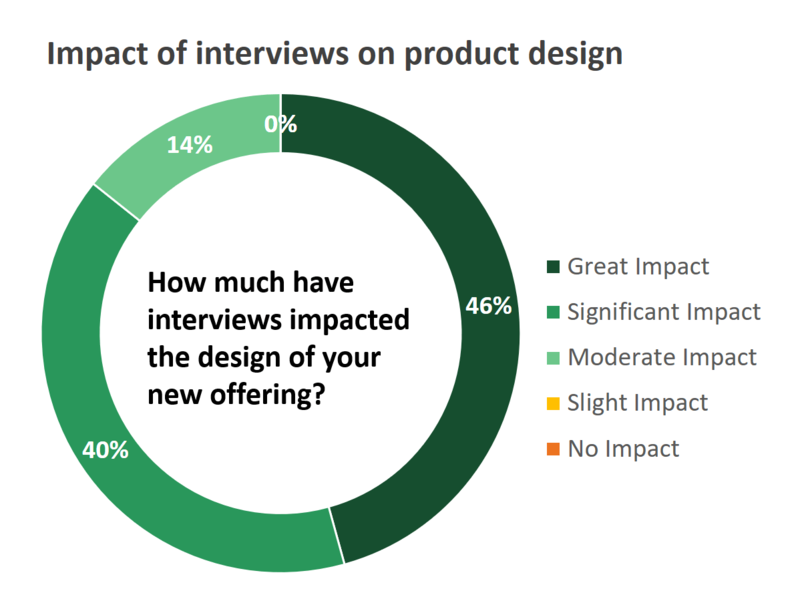 We also asked the teams if these interviews impacted their project scope… and over three-quarters said yes. To be clear, a change in scope is different than a change in design. A change in scope means the team needs to work on a different subject area than it originally intended. Let’s review: For profitable, sustainable growth, you need to improve important, unmet customer outcomes… and your competitors are probably terrible at identifying these outcomes. Is this screaming “competitive advantage” for your company? Is this screaming “competitive advantage” for your company? Think of it this way: Between 1960 and 1980, American companies ignored Dr. Deming’s statistical process control, while Japanese producers adopted it. Japanese global auto production went from 3% to nearly 30% as a result. What if you became the “Toyota” of B2B customer insight in your industry? Interviews are key to avoiding both errors of omission and commission. 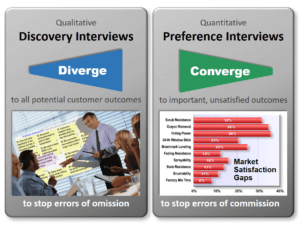 The most important thing to remember is that this methodology helps you avoid errors of omission (failing to uncover unarticulated outcomes) through Discovery interviews, and errors of commission (targeting the wrong outcomes) via Preference interviews. I am better able to listen and probe for deeper understanding. We learned more valuable information than in typical customer interactions. We gained a deeper level of understanding of customer needs. We learned unexpected information in our interviews. Over 90% of teams reported that Blueprinting interviews provided more customer insight than other VOC . In the Preference Interview Research Report, the project teams assessed many aspects of these interviews. For instance, over three-quarters felt that adopting Blueprinting methods across their company would have a “great” or “significant” impact on the success of projects. But many B2B companies do limited “voice-of-customer” interviewing… so a fair question is, “Would other VOC methods have provided as much insight?” When asked this question, over 90% of teams reported that Blueprinting interviews provided more customer insight than other VOC methods. Since the great recession, we’ve noticed something that probably won’t surprise you: Fewer people are doing more work. The result is that the “urgent” work gets done (or at least most of it), but it’s rare to make strong headway on the “important” work. I understand this, and now realize that my years in corporate America (1975-2004) were comparatively “golden years” for implementing change. Today, we routinely see well-meaning, motivated individuals consider implementing real change… over a period of weeks… which turn into months… which turn into years. If it’s any encouragement, this is happening with your competitors, so perhaps you can turn this into a competitive advantage. Our motto is “when you’re ready, we’re ready.” To contact us for a phone consultation, just leave us a note at Contact AIM.